The following article was contributed to autonomedia by John Holloway. We thank John Holloway for his kind permission. It was first published in Common Sense # 19, June 1996. 1. "A new lie is sold to us as history. The lie about the defeat of hope, the lie about the defeat of dignity, the lie about the defeat of humanity". (Subcomandante Marcos in the invitation to an Intercontinental Gathering against Neo-Liberalism, La Jornada, 30/1/96). The lie is a lie about power, and about necessity. After twenty years of neo-liberalism, it is no longer really a lie about desirability. The market optimism of the 80s has been largely replaced by a market realism: not 'everything is perfect under a market system', but 'this is the way things are and this is the way things must be, in reality there is no alternative'. 'A different society might be nice, but it is not possible'. The lie about the defeat of hope is a lie about the defeat of possibility, a lie about the power to change. The zapatistas have a different idea of possibility, a different idea of power. This was expressed by Marcos in a comment on the dialogue between the zapatistas and the government. "This is not a fair dialogue, it is not a dialogue between equals. 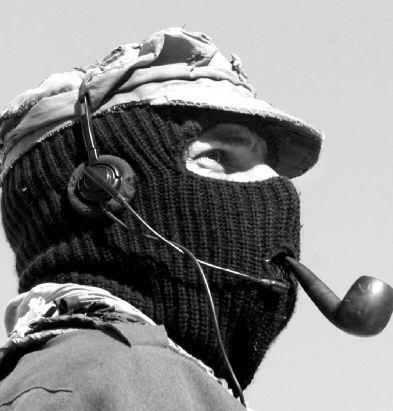 But in this dialogue the EZLN is not the weak party, it is the strong party. On the side of the government there are only military force and the lies spread by some of the media. And force and lies will never, never be stronger than reason. They can impose themselves for days, months or years, but history will finally put each one in its place" (Subcomandante Marcos, 5/5/95, La Jornada, 11/5/95). Very pretty, but it's absurd! How can Marcos's declaration possibly be correct? His reference to history does not answer anything, since history is no more than the result of struggles about power. So how can we possibly maintain that the zapatistas are stronger than the Mexican government, or that reason is stronger than force and lies? To defend such an absurd statement, it would be necessary to defend an absurd theory of power. That is surely the challenge of the zapatistas and their absurd rebellion. The zapatista rebellion is absurd. After the fall of the Berlin Wall, after the defeat of the sandinistas, after the defeat of the revolutions in El Salvador and Guatemala, when China is becoming more and more integrated into the capitalist world market, when the Cuban revolution is finding it increasingly difficult to survive in any form at all, when all the major revolutionary movements have disappeared from Latin America and most other parts of the world, on the very day that Mexico proclaims its modernity through the creation of the NAFTA, on that very day a group of indigenous peasants seize control of San Cristobal and other towns in Chiapas, many of them armed with wooden guns. Not only that, but they soon proclaim their absurd notions openly: they, a group of a few thousand indigenous rebels in the jungle of the south-east of Mexico want to change the world. What is more, most absurd of all, most important, most central to their whole absurd project, they want to change the world without taking power. And on top of that their discourse is full of jokes, of stories, of children, of dancing. How can we take such a rebellion seriously? It all seems too much of a colourful tale from a novel by Gabriel Garcia Marquez for it to be of serious relevance to us here in Europe. I want to take the zapatistas seriously. I want Marcos to be right when he says that they are stronger than the Mexican government. I want them to be right when they say that they want to change the world without taking power. I want them to be right because I do not see any other way out of the tragedy we are living, in which about 50,000 people die each day of starvation, in which over a thousand million people live in extreme poverty. Revolution is desperately urgent, but often it appears that we are trapped in a desperately urgent impossibility. I want Marcos's declarations to be not only beautiful and poetic but to have a real theoretical and practical foundation. But wanting them to be right is not enough. If we want them to be right, we must try to understand, criticise and strengthen the theoretical and practical foundation of what they are doing. The zapatistas pose a theoretical and practical challenge: a challenge to all the established practices and ideas of the revolutionary left or indeed of the Left in the broadest sense. As Marcos puts it in a comment on the first year of the uprising, "Something broke in this year, not just the false image of modernity sold to us by neoliberalism, not just the falsity of government projects, of institutional alms, not just the unjust neglect by the country of its original inhabitants, but also the rigid schemes of a Left living in and from the past. In the midst of this navigating from pain to hope, political struggle finds itself naked, bereft of the rusty garb inherited from pain: it is hope which obliges it to look for new forms of struggle, that is, new ways of being political, of doing politics: a new politics, a new political morality, a new political ethic is not just a wish, it is the only way to go forward, to jump to the other side". (Subcdte Marcos - citado por Rosario Ibarra, La Jornada, 2/5/95). He might also have added, "a new political theory, a new understanding of politics and of power". 2. Power is usually associated with control of money or the state. The Left, in particular, has usually seen social transformation in terms of control of the state. The strategies of the mainstream left have generally aimed at winning control of the state and using the state to transform society. The reformist left sees gaining control of the state in terms of winning elections, the revolutionary left (certainly in the leninist and guerrillero traditions) thinks of it in terms of the seizure of state power. The classic controversies between reformists and revolutionaries have been about the means of winning control of the state. The actual goal of taking state power is generally taken as an obvious prerequisite for changing society. The attempts to transform society through the state (whether by reformist or revolutionary means) have never achieved what they set out to do. So many historical failures cannot be accounted for in terms of 'betrayal' of the revolution or of the people. The failure of so many attempts to use state power suggests rather that the state is not the site of power. States are embedded in a world-wide web of capitalist social relations that defines their character. States are incapable of bringing about radical social change simply because the flight of capital which any such attempt would cause would threaten the very existence of the state. The notion of state power is a mirage: the seizure of the state is not the seizure of power. The attempts to transform society through the state have not just failed to achieve that end. The fixation on the state has tended to destroy the movements pushing for radical change. If states are embedded in a global web of capitalism, that means that they tend to reproduce capitalist social relations through the way that they operate. States function in such a way as to reproduce the capitalist status quo. In their relation to us, and in our relation to them, there is a filtering out of anything that is not compatible with the reproduction of capitalist social relations. This may be a violent filtering, as in the repression of revolutionary or subversive activity, but it is also a less perceptible filtering, a sidelining or suppression of passions, loves, hates, anger, laughter, dancing. The state divides the public from the private and, in so doing, imposes a division upon us, separates our public, serious side from our private, frivolous, irrelevant side. The state fragments us, alienates us from ourselves. The problem with any left activity oriented towards the state is that it tends to reproduce the same fragmentation of the person. If power is identified with the state, then winning power is identified with the suppression of part of ourselves: with seriousness, dedication, sacrifice, the elimination of all 'irresponsibility'. In the case of reformist political parties which are oriented to winning control of the state by electoral means, the nature of the state's insertion in capitalist social relations means that there are considerable pressures on the party to project itself as serious, responsible and respectful of property, and to suppress any rank-and-file activity which does not correspond to this image. Revolutionaries do not produce the image of the state in quite the same way, but, especially where conditions are such as to make any revolutionary organisation clandestine, a revolutionary must be prepared to dedicate himself, to sacrifice, to subordinate his life to the higher goal of winning power. Although the aim may be to create a society in which the person would be whole, in which alienation would be overcome, it is assumed that in the meantime the winning of power requires the fragmentation of oneself. It is assumed that in a nasty, alienated society, the only way of taking on the enemy is to adopt the enemy's language and forms of organisation. This way of looking at power has its most extreme expression in the identification of power with military force. The army (whether state or revolutionary) is not only a model for factory organisation but its exaggeration, the intensification of self-alienation to its extreme, the maximum subordination of normal affective life. In the idea that power is military force (and that power must be won by military force), power and dehumanisation (of self and others) are treated as practically identical. The state-oriented tradition of organisation privileges men (and especially young men), not necessarily in the sense of any direct discrimination against women, but above all in the way that different forms of social experience are valued. Professional dedication to the revolution promotes a culture in which there is a hierarchisation of social experience and activity. Action or experience directed at the state is given priority, and other types of experience (affective relations, playing with children, sensuality etc) are accorded a secondary importance. The same separation between the public and the private, between the serious and the frivolous, which is the basis of the existence of the state, is reproduced within the revolutionary (or reformist) organisation. In the capitalist world, politics is a serious (not to say boring) business, a matter above all for the serious (not to say boring) gender, a matter that has no room for children, jokes or games. In the world of the traditional left, it is not very different. 3. If it is correct to see the idea of the revolutionary seizure of state power as an idea particularly suited to the experience of young single people, then it is easy to understand why the zapatistas abandoned their traditional notions of revolution as they became transformed from a revolutionary group into a community in arms. They have repeatedly said that they do not want to conquer state power. Time and time again, in their practice and in their declarations, they have rejected the state as a form of action. The most fundamental example of their rejection of the state as a form of organisation is their insistence on the principle of 'mandar obedeciendo', 'lead by obeying', the idea that the leaders of the movement must obey the members, and that all major decisions should be taken through a process of collective decision making. This principle has meant constant friction in the dialogue with the government, as can be seen for example in the conflict over the issue of time. Given the bad conditions of communication in the Lacandona Jungle, and the need to discuss everything thoroughly, the principle of 'mandar obedeciendo' means that decisions take time. When the government representatives insisted on rapid replies, the zapatistas replied that they did not understand the indigenous clock. As recounted by Comandante David afterwards, the zapatistas explained that 'we, as Indians, have rhythms, forms of understanding, of deciding, of reaching agreements. And when we told them that, they replied by making fun of us; well then, they said, we don't understand why you say that because we see that you have Japanese watches, so how do you say that you are wearing indigenous watches, that's from Japan' (La Jornada, 17/5/95). And Comandante Tacho commented: 'They haven't learned. They understand us backwards. We use time, not the clock' (La Jornada, 18/5/95). The rejection of the state is central also to the zapatistas' relations with 'civil society'. All their strategies to build a unity of action with those engaged in other forms of struggle quite explicitly bypass the state. Most recently, in the Fourth Declaration of the Lacandona Jungle, issued at the beginning of this year, in which they propose the formation of a Front of National Liberation, they make it an explicit condition for joining this front that members should renounce all aspiration to hold state office - an idea which has scandalised sympathisers both on the reformist and the trotskyist left. 4. But then what? The zapatistas say that they do not want to conquer the world, just to make it new. But that implies some concept of strength or power. If power is not defined as the state, or as military force, then what is the alternative? How can we think of the power of those without power, the face of those without face, the voice of those without voice? The zapatistas speak of what they say as the 'word of those who are armed with truth and fire' ('la palabra de los armados de verdad y fuego'). The fire is there, but the truth comes first, not just as a moral attribute, but as a weapon: they are armed with truth, and this is a more important weapon than the firepower of their guns. Although they are organised as an army, they aim to win by truth, not by fire. Those 'without voice, without face' are armed with truth. Their truth is not just that they speak the truth about their situation or about the country, but that they are true to themselves. Truth is dignity, having the dignity to say at last the 'Enough!' that would restore meaning to the deaths of their dead. Dignity is to assert one's humanity in a society which treats us inhumanly. Dignity is to assert our wholeness in a society which fragments us. Dignity is to assert control over one's life in a society which denies such control. Dignity is to live in the present the Not Yet for which we struggle. To be armed with truth or dignity is to assert the power of living now that which is not yet. In the assertion that they/ we are armed with truth or dignity, the conventional concept of power is reversed. Power is not that which is , but that which is not, that which is Not Yet (as Bloch would put it). In a society in which that which is ('that's the way things are') rules, in which identity is lord, to be armed with dignity is to assert the power of non-identity. In a society based on human alienation, the zapatistas raise the banner of non-alienation, of that which is suppressed, of laughing, singing and dancing, of that which simply does not appear in the normal categories of social science, constructed as they are on the basis of the Is-ness or identity of the world. But is this not empty, metaphysical nonsense? How can one speak of the power of that which is not yet, of non-alienation, of non-identity, of dignity and truth? History is littered with the corpses of the true and dignified, and ultimately powerless. The appeal to that which is Not Yet would be purely metaphysical if the Not Yet did not exist in some form already. The appeal to a pre-given History, or to some Dignity, understood as a pre-given Platonic essence, does not help at all. It is only if we understand dignity, truth, non-identity, the Not Yet as already existing that we can begin to think of power in those terms. They exist, of course, not as transcendent essences, but as present refusal, as struggle, as negation of the untruth of capitalist society. Truth exists as stuggle against untruth, dignity as struggle against degradation, non-alienation as struggle against alienation, non-identity as struggle against identity, the not-yet as struggle against the present. In short, they exist as the !Ya Basta! inside all of us. This is expressed very nicely by Antonio Garcia de Leon in his prologue to one of the editions of the zapatista communiques, where he says "as more and more rebel communiques were issued, we realised that in reality the revolt came from the depths of ourselves". The power of the zapatistas is the power of the !Ya Basta!, the negation of oppression, which exists in the depths of all of us. How do we know that the !Ya Basta! exists? We know it must exist in all of us, possibly very suppressed, always in contradictory form, but always there, not just from experience, but simply because it is an inseparable part of life in an oppressive society. We can see manifestations of it in the million different struggles that make up life in a capitalist society, from the strikes that shook France at the end of last year to the cursing of the alarm clock that tells us it is time to go to an alienating job in the mornings. But there is no way it can be measured, no way in which we can empirically define it. The fact that it exists in often unarticulated form means that there is an irreducible unpredictability in social development. The question of the power of the zapatistas can now be reformulated as the question of how we articulate the !Ya Basta! - not their !Ya Basta! but our !Ya basta! If we think of their power in this sense, it helps us to understand why the zapatistas have not (or not yet) been suppressed militarily: it is not due primarily to their military strength, but to the extraordinary resonance of their !Ya Basta! in Mexico and throughout the world. Thinking of the issue of power in this way also helps us to understand aspects of the zapatistas' politics. The understanding of people as already having dignity in a society which degrades them, as already having truth in an untrue society (truth and dignity not as essential qualities but as negation of degradation and untruth) is the crucial turning point in their concept of revolution. Understanding people as having dignity implies a politics of listening and not just talking (a politics of mutual recognition). Through the process of being integrated into the communities of the Lacandona Jungle, the original group of revolutionaries were forced to listen in order to communicate, they were forced to abandon the great revolutionary tradition of talking, of telling people what to think. Revolutionary politics then becomes the articulation of Dignity's struggle, rather than the bringing of class consciousness to the people from outside. From this follow two of the key phrases of the zapatista discourse - 'mandar obedeciendo' (to lead by obeying) and 'preguntando caminamos' (asking we walk). Revolution is redefined as a question rather than an answer: revolution is "revolution with a small 'r'", rather than Revolution with a capital R. It refers to the creative and imaginative articulation of dignity now, and not to a future event, the arrival at a pre-defined promised land. The notion of dignity and of listening to people's struggles also helps to explain why the zapatistas do not call for supporters to come and join them in the jungle, but insist rather that people should struggle wherever they are in whatever way they can. In effect they say not "we are right, join us", but "we must all struggle to express our !Ya Basta!". The various political initiatives they have taken - the National Democratic Convention in Aguascalientes, the national and international consultations on the aims and future of the zapatistas, the movement of national liberation, the indigenous forum, and now the intercontinental gathering against neo-liberalism - all aim, not at building up their own membership, nor at constructing a solidarity movement, but at stimulating others to strengthen their own struggles for democracy, freedom and justice. Their appeal is a general one, to what they call 'civil society'. They do not talk either of class struggle or of the proletariat. This has been criticised by some Marxists as reformist, but, although the concept of 'civil society' is unsatisfactory in some respects, it is understandable why the zapatistas should prefer to avoid the vocabulary of the Marxist tradition, laden as it is with a hundred years of positivist interpretation. The concept of the proletariat is particularly problematic. As usually understood, it refers to a particular group of people defined by a particular type of subjection to capital. As such, it privileges the struggles of certain people over others and certain types of struggle over others. The zapatistas' concept of !Ya basta!, on the other hand, more in keeping with Marx's own work, it seems to me, can be seen as based on the idea that the class antagonism runs through all of us, although in different ways, and as allowing a much richer concept of struggle as embracing all aspects of human activity. In the past two years, this group of rebels in the jungle of the south-east of Mexico, born of the interaction of a group of revolutionaries with the traditions of struggle of the indigenous people of Chiapas, born in the 1990s of the horrors of world neo-liberalism which force so many people either to die in misery or to say "!Ya Basta! ", has crystallised (and advanced) to a remarkable extent the themes of oppositional thought and action that have been discussed throughout the world in recent years: the issues of gender, age, childhood, death and the dead. All flow from the understanding of politics as a politics of dignity, a politics which recognises the particular oppression of, and respects the struggles of, women, children, the old. Respect for the struggles of the old is a constant theme of Marcos's stories, particularly through the figure of Old Antonio, but was also forcefully underlined by the emergence of Comandante Trinidad as one of the leading figures in the dialogue of San Andres. The way in which women have imposed recognition of their struggles on the zapatista men is well known, and can be seen, for example, in the Revolutionary Law for Women, issued on the first day of the uprising, or in the fact that it was a woman, Ana Maria, who led the most important military action undertaken by the zapatistas, the occupation of San Cristobal on the 1st January 1994. The question of childhood and the freedom to play is a constant theme in Marcos's letters and is highlighted in a recent interview as the issue that he regards as most important: "In our dream children are children and their work is to be children... I do not dream of the agrarian redistribution, of big mobilisations, of the fall of the government and elections and the victory of a left-wing party, or whatever. I dream of the children and I see them being children... We, the zapatista children, think that our work as children is to play and to learn" (interview with Cristian Calonico Lucio, 11/11/95, [not published at the time this article was written -@kÃ¶r autonomedia]). It is not that the struggle of the zapatistas - the military conflict and the prolonged dialogue with the government - has also raised these important issues. Rather these issues are central to the struggle. The struggle is not just about gaining material improvements, better housing, schools, hospitals and so on: it is about creating a world in which people can live with dignity, a mutually recognitive world in which people can relate to each other without hiding behind masks. Seen in this light, the letters of Marcos, the poetry, the theatre of Aguascalientes and the dances that punctuate all that the zapatistas do are not embellishments of a revolutionary process but central to it. The question for us, then, is not how we can build solidarity committees, but how we can join in the process that they have started. How can we theorise and articulate our own !Ya Basta!? How can we think about the unity of our particular struggles and the struggles of the other zapatistas, those in the southeast of Mexico? How can we articulate that unity in a struggle for a society in which dignity would no longer be a struggle against degradation? It is presumably to stir up such questions that the zapatistas are calling for an Intercontinental Gathering for Humanity and against Neo-Liberalism, to be celebrated between the months of April and August in the five continents . The zapatistas, far from being just another rebellion in some far-off land, challenge us theoretically and practically, challenge us to join in the struggle for dignity: dignity, according to Marcos in the declaration calling for the intercontinental gathering, "is that nation without nationality, that rainbow that is also a bridge, that murmur of the heart no matter what blood lives in it, that rebel irreverence that mocks borders, customs and wars". Preguntando caminamos. Asking we walk.